What's the Best Men's Deodorant? Last week we tackled bad breath. Now let’s go ahead and move on to your armpits before summer really kicks in. 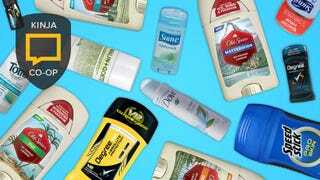 What’s the best men’s deodorant? Tell us in the comments. Looking for women’s deodorant instead? What&apos;s the Best Women&apos;s Deodorant? The specific name of the product, not just a brand or series. Why you think this item is the best. A link where the item can be purchased. Commerce covers the best products on Kinja Gear, finds you deals on those products on Kinja Deals, and asks you about your favorites on Kinja Co-Op, click here to learn more. We operate independently of Editorial and Advemrtising, and if you buy something through our posts, we may get a small share of the sale. We want your feedback.